This was the Zen expression for today’s event at Meishouan Tea House. And it was indeed, a good day. Today was the first classroom collaboration between me and Meishouan Tea House. 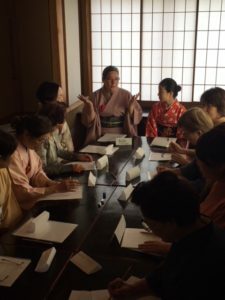 From 10:00-15:00, we hosted 15 participants in the 英語で習う！茶道教室 (Let’s Learn Tea Ceremony in English!). I didn’t know the English level of the participants. Nor did I know how much they knew about the Way of Tea. Once we began, however, I could see this was an enthusiastic group. My first surprise came when we did self-introductions. Many participants have already been studying the Way of Tea in English! They had no trouble explaining themselves in English smoothly. 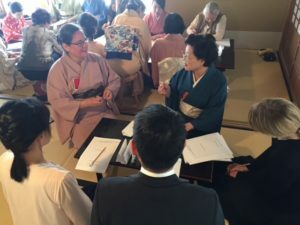 Next, participants spent time thinking about what kind of information they would need to say to a guest who had never participated in a tea event. After writing the Japanese, participants changed it to English. Then, they made groups in the tearoom and practiced the English while they made, served and drank tea. Taking a rest for lunch. By 12:15 we were done with the morning practice and it was time for lunch. We took a much-needed break! We also had time to decide who would be making and serving tea for the afternoon session. A tea gathering with an English-speaking host. 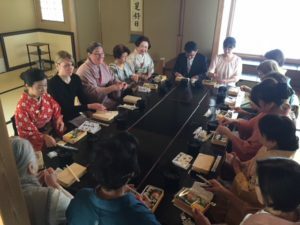 The afternoon session was like a tea gathering hosted by a non-Japanese person–me! I made two bowls of tea for the first two guests. These two guests were a pair; both of them could ask any questions they wished. (Of course, the questions and answers were all in English.) Then another person took my place and made tea for the next two guests. I continued to answer questions for the guests as they rotated. Could you please read the scroll? What is the difference between thin and thick tea? Why do people bow before the scroll? 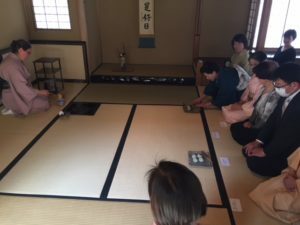 Is the tea ceremony religious? By the time we all had tea and asked our questions, we were out of time. Maybe participants were a bit tired and ready to go home, but I was sorry to say goodbye. I hope there will be more opportunity to see these tea practitioners again soon! Meishouan Tea House–you have my gratitude! Thank you!